Spring already? Man, I miss winter with all its crazy nonsense and snow and not 80 degree weather… Right, then, enough of my complaining about something that’s not Black Rock Shooter’s post-credits! Space Brothers is… well, quite self-explanatory. Brothers going to space. Or trying to, anyway. I have to say, I was expecting some boring, bland series going into this. Thankfully, Space Brothers proves to be anything but that. The art is absolutely fantastic and very much like Cromartie High in some respects. There are a few particularly brilliant moments in the first episode, such as present-day Mutta listening to the tape he recorded as a child. The sepia-toned characters on a black background worked nicely, as did the setting finally coming into view when the ‘UFO’ appeared and they made their promise. It’s a great way of showing how vividly he remembers that day. Another excellent scene would have to be Hibito at training. He’s surrounded by this grey, dead machinery until he presses a button. Then everything lights up and becomes just all kinds of beautiful before fading to an aerial shot of Japan dotted with lights. The music is also really well-done. It fits the scene and is actually kind of noticeable this time around. Special mention goes to the opening for being completely silly. You guys get where I’m coming from with the whole ‘It’s like Cromartie High, except without all the drugs’ thing? 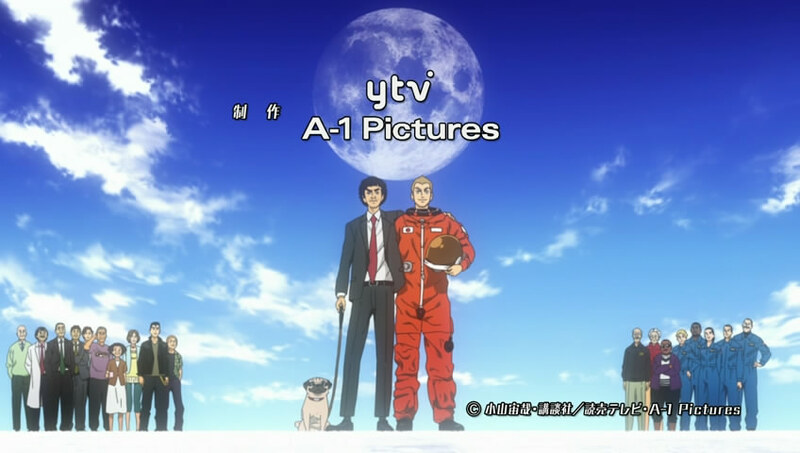 Space Brothers’ ending theme is far more down-to-earth and serious, but it’s not quite my thing. Voice acting is also extremely high quality, especially adult Mutta’s. The plot hasn’t really gotten started yet, but it’s definitely going to be one of those things you watch for the character development. Everyone feels real. You can understand Mutta’s father being disappointed, hell even annoyed, that his adult son moved back in like some kind of deadbeat. Granted, he may not have expected much of Mutta, given the outcome of the sports game when he was born. You can still tell that his parents love him, though, even though his father is… seemingly distant and traditionally Japanese, if that makes sense. All in all, Space Brothers is definitely something I’m keeping up with and I highly recommend you fine folks to do so, too. It’s got so many opportunities to be an excellent show, I really hope they do great things with this. Anyway, that’s me done for now. No champion impressions tomorrow because I don’t feel comfortable writing about anyone else yet and I’d hate to put out something less than great. Also, Brave 10 final impressions are coming, but that’ll probably hit around Thursday or Friday. As always, thanks for reading and have a good’un. This entry was posted in Anime and Manga, First Impressions and tagged space brothers anime, space brothers episode 1, space brothers first impressions, space brothers opening. Bookmark the permalink. You’re complaining about no snow? And warm weather? For shame! Yay for Spring and possibly an enjoyable spring season of anime. Speaking as a man with allergies and who doesn’t like heat: Spring be damned! I have allergies but I hate being cold more than anything. So I’ve just sucked it up (literally, the pollen), taken my sinus and congestion meds and kept going. Oh, and I wear a mask. I more of a Spring/Fall person myself, given that in Winter my house’s pipes freeze and in Summer I burn like a match. Having no known allergies also helps. Nice review, I’ll have to check this out. Also, I look forward to your Brave 10 review! I just wrote one myself, and “comparing notes” is one of my favorite things to do. Hooray people enjoy my stuff! I’ve only watched… Well, aside from that new Lupin series (which I can’t enjoy, sadly), what I’ve posted here. This week has been all kinds of crazy.